Hello everyone, I am in need of some advice. I picked up a used 12sb (silver deck, unsure what engine - it is self-propelled with 5 speeds) from a Goodwill auction (great deal) and everything is clean and looks great but after prepping it I am only able to get it to run for about 30 seconds and it cuts off. A friend (not a mechanic but has some experience) thinks it must be the fuel line or the carburetor. The blade/deck look excellent and the whole machine appears to have been well maintained so I am wondering if it will be worth it to have it repaired? 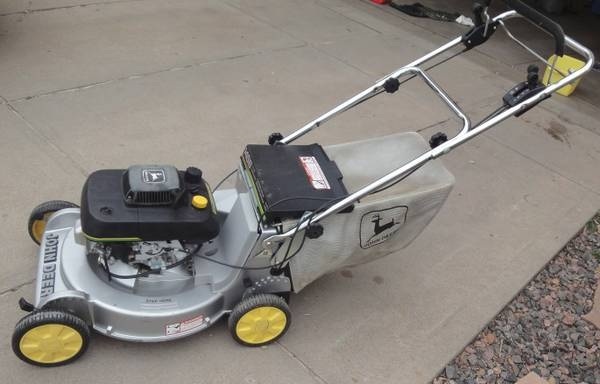 I know it is a pretty old model but bought it anyway based on the countless glowing reviews and would really love to get it running but have no experience with the cost of repairs for higher end mowers. It looks like the mower in the photo but is the 12SB not the 14. Any advice is greatly appreciated! ABSOLUTELY it is worth it to fix it up. Those things are still one of the best walk behinds ever produced! Even if it is 25+ years old. I'll take em over a honda anyday. You can turn around and probably sell it for $200 too. Did you get the mulching plug block with it? Someone might chime in regarding the running issue. Probably just needs a good carb cleaning. I have a younger sibling of that, the JX75 and I've had a few 14SBs as well. never had a 12SB. That engine is likely the 4HP Kawaski engine, a very good engine. The 14SB was far more common than the 12SB though. Sounds like fuel not flowing into the carburator fast enough and once it empties the float bowl it dies. Might for the heck of it try loosening the gas cap and see if it keeps running. Might be a plugged vent. Might be a partly blocked fuel line too. Since it does run for 30 seconds might be float issue in carb. But if it runs ok for those 30 seconds thinking more like slow fuel delivery to the carb. I was thinking about trying the gas cap trick after reading about it. I will tomorrow. It was also in gear when I started it and was ready to take off, haha.. I have a new Honda mower and I hate it. My old mower was a Murray mulcher with a Tecumseh engine and it could mow down anything. The engine far outlasted the deck but I kept using it until it was basically no longer safe - loved that thing, had it for years and it was used when I got it. Thanks you guys - I am definitely going to get it fixed.